Tweet scheduling. You’ve heard people talk about it. It’s one of those things that you feel like you should be on board with, but the sheer number of options available are a little intimidating. Or perhaps you’re a personal user wanting to schedule Tweets and you’d rather not pay through the nose to be able to schedule Tweets when you’re not around. There are a number of tools that make Tweet scheduling affordable for brands and personal users alike, read on. Why should I schedule Tweets? 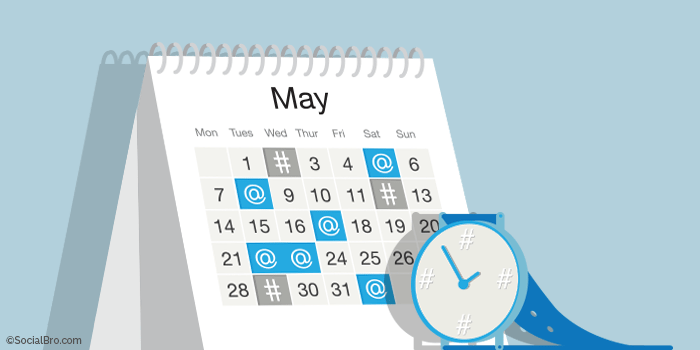 Scheduling Tweet gives marketers and community managers flexibility when managing their Twitter accounts. You can schedule Tweets to post on evenings, weekends, holidays, when you need to nip out for lunch and any other inconvenient times you can think of (i.e. if you need to post in the middle of the night to market to a different timezone). It also also gives you freedom to break up the flow of Tweets, making them consistent throughout the week, and means you can plan content in advance to devote precious time that would normally be spent on social elsewhere. Tweet scheduling is the ability to publish content at any time automatically, without the need to have staff around to compose and publish them. As long as the Tweet has been written and queued up ready to be Tweeted, it’s all taken care of. However, Tweet scheduling is not a native feature for all users. It can only be accessed on Twitter by people using Twitter’s Ad Products. We’ve highlighted our favorite tools - Hootsuite and Buffer - to help you schedule Tweets, so you can be confident that whatever you choose and ace Tweet scheduling. 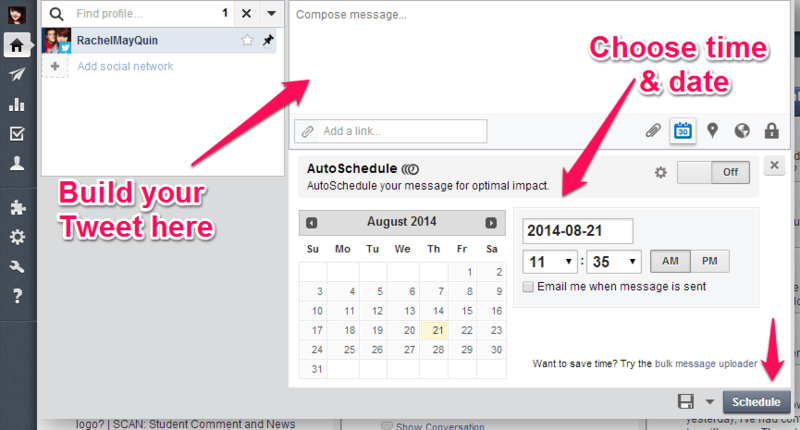 Hootsuite provides many different options for your Tweet scheduling (and works perfectly with SocialBro). They have a number of different plans to choose from, tailored to various kinds of Twitter users. Scheduling a Tweet with Hootsuite is a simple process, just click ‘Compose message’ in your top navigation bar, select which profile you’d like to Tweet from and start building. Business users also have the ability to schedule their Tweets in bulk, and you can review your schedule at any time to make changes as you see fit. Buffer is another tool for scheduling Tweets and also works hand-in-hand with SocialBro to optimze your Tweeting schedule. 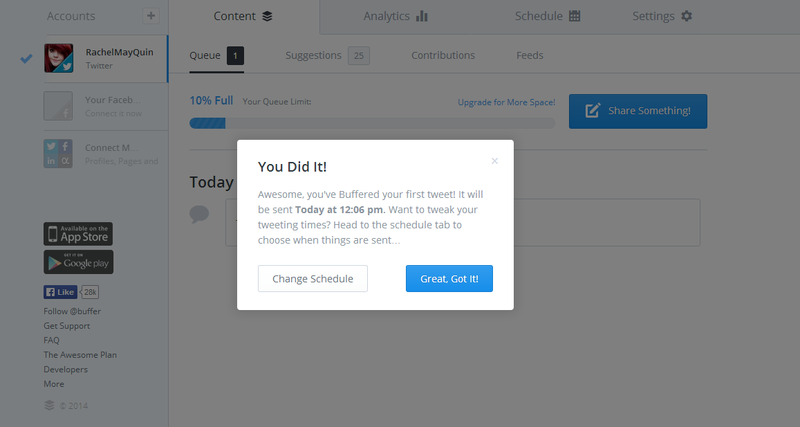 Buffer allows you to set times each day that content will be posted on Twitter. Buffer also integrates with Bit.ly for link shortening so simply create your Tweets and the tool will arrange them for you. Start off by choosing which profile you’d like to post from, write your Tweet, then select Add To Queue. 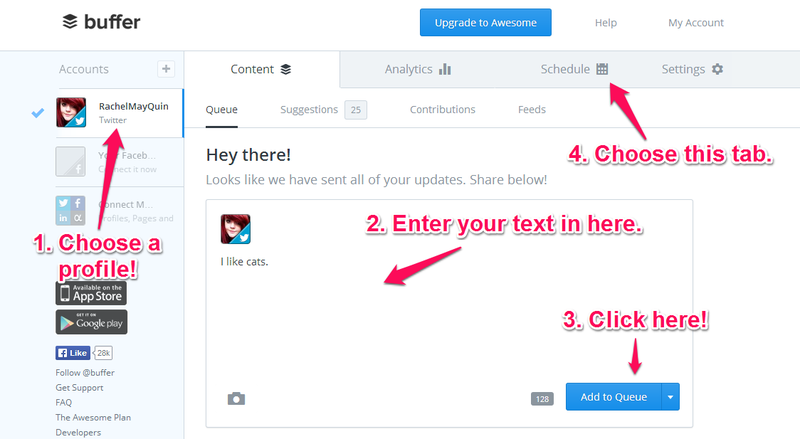 Once you have queued your Tweet, it will be added to your next posting slot, all ready to go! 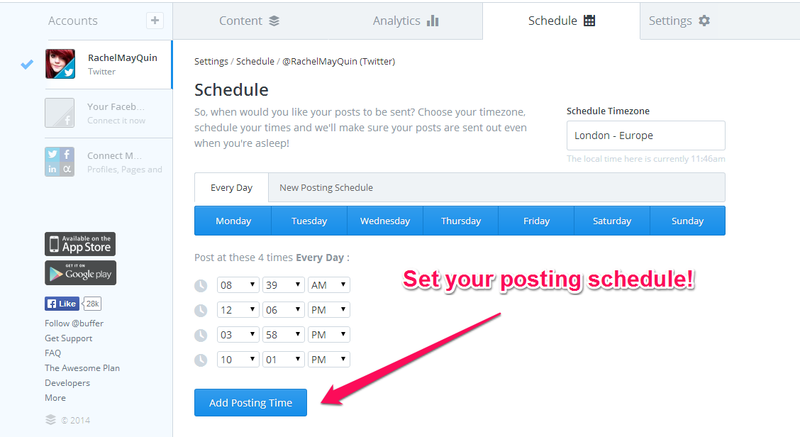 If you’d like to make any changes to your posting times, navigate to the Schedule tab. What else can I do to ace Tweeting scheduling? Clever Twitter users like to use Tweet scheduling tools in conjunction with SocialBro’s best time to post tool. Both Hootsuite and Buffer work with SocialBro to optimize your Tweeting schedule and ensure your content doesn’t go to waste. SocialBro can also help you analyze your Twitter community and gain deeper insight into what makes your audience tick. When are they online? How can you make sure you’re maximizing engagement? What topics do they talk about most? Not sure if you’re Tweets are hitting the mark? Well we also offer a Tweet Analytics tool, which provides useful insight into what content/Tweets are working well within your community and what ones aren’t. ← Audiense CEO, Javier Burón, Takes On The #IceBucketChallenge!